In the centre of the galaxy OJ 287, there is one active, super-mass-rich black hole. An international research team led by Silke Britzen of the Max Planck Institute for Radio Astronomy has now discovered that the active nucleus of this galaxy generates a jet that staggers like a spinning top on a time jet on a timescale of about 22 years. With this movement called ‘precession’, the fluctuation of the radiation of OJ 287 can be explained. The discovery thus provides the key to understanding the variability in active galaxy nuclei. However, despite decades of radio observations of many jet sources and many sophisticated studies, jets remained enigmatic. Traditionally, the origin of the jet brightness variations observed at radio wavelengths was attributed to the jet feeding mechanism by the central black hole system. On the other hand, the observed moving features in the jets – called knots – were attributed to shocks traveling in the jet. Researchers looked for a connection between both phenomena but this could not be done consistently so far. “We realized that it is the same physical process that explains both the jet wandering in the sky and the brightness variations of the galaxy – that is the change of motion of the jet. It’s all geometry and deterministic. No magic involved, so far”, adds Silke Britzen. “This offers a unique opportunity to understand the jets and their potential origin in the immediate vicinity of the black hole. This jet really serves as Rosetta stone for us and will allow to understand jets and their active black holes much more fundamentally.”Britzen and her team are convinced that the precession-scenario can also explain the 130 years of optical flaring of this source but, as always, more data and more work is required for a final confirmation. A pressing question remains about the origin of the jet precession. Precession is a physical process well-known from spinning tops or the Earth itself. The rotational axis of our planet is not stable but orbiting in space with a period of 26,000 years due to the tidal influence of the Sun and the moon. For the jet precession in OJ 287 the team has indicated two possible scenarios. “We either have a system of two supermassive black holes with the disk-ejecting jet forced to wobble by tidal effects of the secondary black hole or a single black hole that is tidaly interacting with a misaligned accretion disk,” concludes Christian Fendt from the Max Planck Institute for Astronomy (MPIA) in Heidelberg.Either way, the jet of the active galaxy OJ 287 is one of the best understood jets so far and will certainly be used to decipher other extragalactic jets as well. 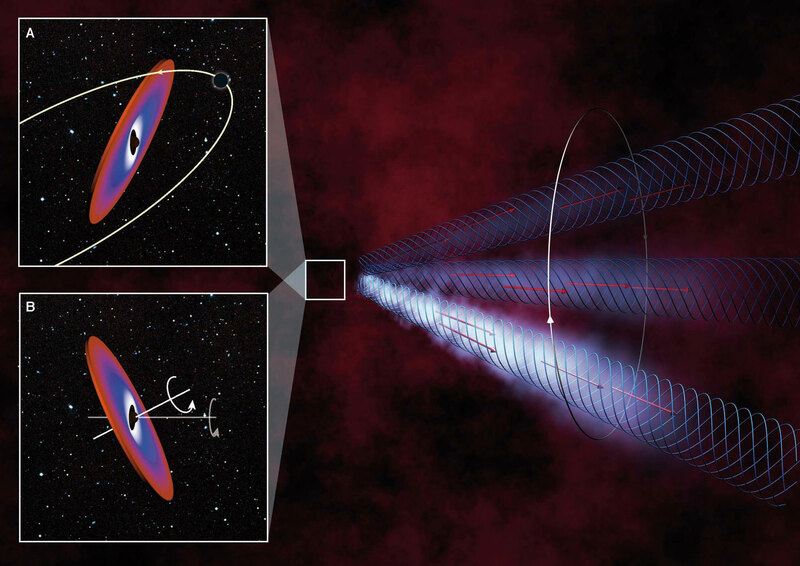 It might even help to further unravel the enigmatic activity of supermassive black holes. Be the first to comment on "Astronomers Investigate Supermassive Black Hole Radio Jet In Unprecedented Detail"